Plumbing Problems, Plant City, FL | A Step Above Plumbing Inc. Plumbing Problems, Plant City, FL | A Step Above Plumbing Inc.
We’ll take care of any plumbing problems in your Plant City home or office building. It’s never fun to deal with plumbing problems at your home or business, but it’s an unfortunate reality that most people will have to handle at some point. When you experience a problem, the first step is to call a plumber to assess the issue and come up with a plan for repair. Ignoring plumbing problems can lead to serious water damage in the structure, which can quickly destroy flooring, drywall, and any personal possessions in its path. Moisture can also cause mold growth, which reduces indoor air quality and can cause unpleasant symptoms in those who suffer from mold allergies. Some of the most common plumbing problems that we see include dripping faucets, leaky water heaters, running toilets, clogged drains, and broken pipes. Anytime you have a leaky faucet or appliance, you could end up spending a lot more on the water every month because of the substantial waste. Clogged drains can cause the sink or toilet to overflow, while a broken pipe can allow a significant amount of water to leak out. Instead of burying your head in the sand and pretending not to notice that slow-moving drain or wet spot around your drain, give us a call at A Step Above Plumbing Inc. We’ll take care of any plumbing problems in your Plant City, Florida home or office building. Our team has been serving the area for nearly 15 years, delivering solutions for plumbing problems that are causing issues in your building. 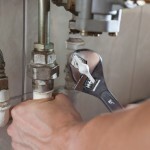 We specialize in both residential and commercial plumbing services.